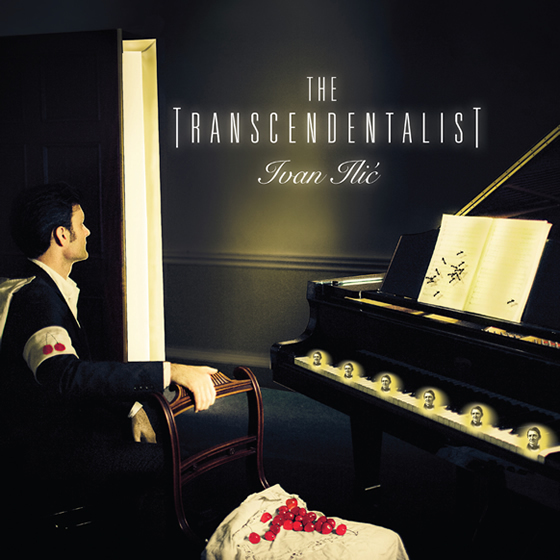 Serbian American pianist Ivan Ilić (EE-van EE-litch) enjoys a unique place in today’s musical landscape thanks to his unconventional repertoire and multifaceted approach. By combining performing with writing, producing radio and video, and drawing upon key interdisciplinary experiences with visual art, acting, and the neuroscience of learning, he develops new audiences for unfamiliar music. His eclecticism is reflected in his choice of musical projects, which range from the notoriously difficult Chopin/Godowsky studies, to the delicate abstraction of Morton Feldman, to his most recent enterprise: the rediscovery of music by Beethoven’s Czech friend and contemporary, Antoine Reicha (1770-1836). In 2016 he began focussing on Reicha’s neglected piano music, which he is recording in a 5-album series for Chandos Records. 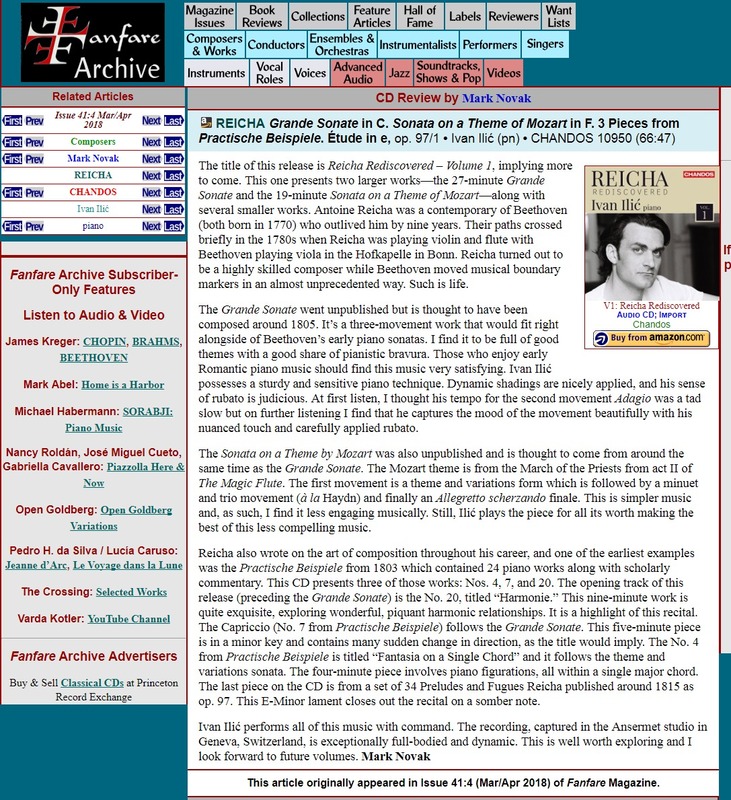 Volume 1 of the Reicha Rediscovered series, supported by Swiss Radio RTS and the Palazzetto Bru Zane in Venice, led to a surge of interest in Reicha’s music. Editorial and reviews in the British, German, French, and Italian classical media raised the same question: how is it possible that such remarkable music by a friend of Beethoven, a student of Haydn, and the counterpoint teacher of Liszt, Berlioz, Franck and others, has never been recorded before? After the score languished in the French National Library for over 200 years, a piece from Volume 1 was listened to over 950,000 times on Apple Music. This led to a short documentary series about Reicha written and presented by Ilić, which in turn led to a widely-shared feature story in The New York Times. Volume 2 of the series was released in September 2018, with prominent media coverage in Germany, France, Luxembourg, the UK, the Netherlands, Switzerland, Korea and Australia. 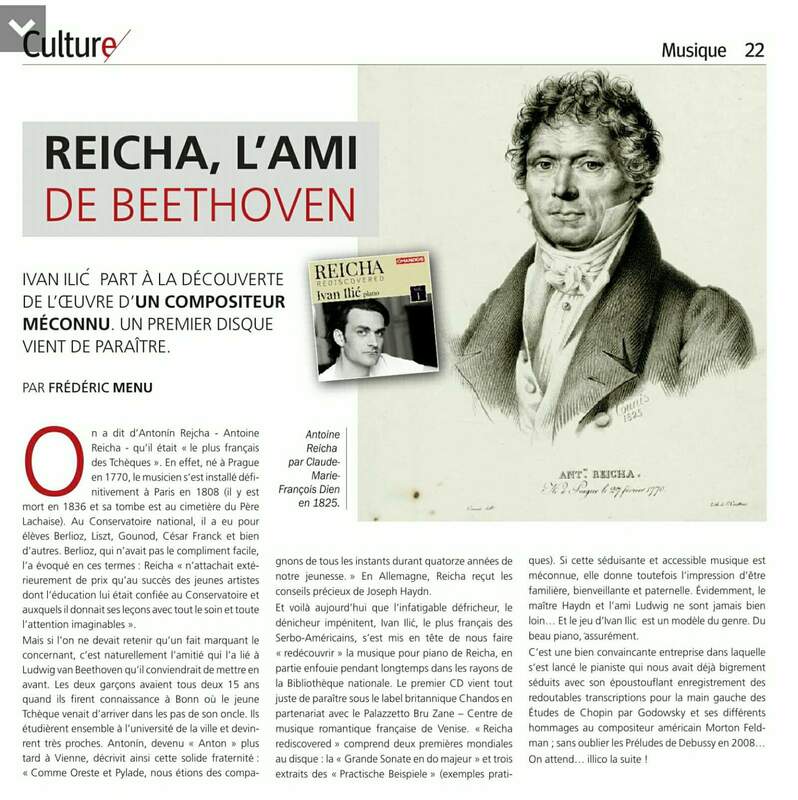 BBC Music Magazine wrote “In this pianist, Reicha’s music has the best possible advocate”. Ilić earned degrees in mathematics and music at the University of California Berkeley before moving to Paris with a Hertz Fellowship. He then studied at the Conservatoire Supérieur de Paris, where he received a Premier Prix, and the Ecole Normale de Musique de Paris for postgraduate work. The City of Paris sponsored his first recording. Early career highlights included recitals at Carnegie Hall, Wigmore Hall, Ireland's National Concert Hall, Toronto's Glenn Gould Studio, and the American Academy in Rome. He recently gave recital débuts in Vienna, Sao Paulo, Geneva, and Amsterdam. Recordings have played a significant role in spreading Ilić’s international recognition. His CD of 24 Préludes by Claude Debussy  received Mezzo Television's Critic's Choice Award in France, and was a Top Five CD of the Year of Fanfare Magazine and Classique News. His next CD  featured the complete Chopin Studies for the left hand by Leopold Godowsky, a tour-de-force of musicianship and virtuosity. The recording was described as "a major achievement" and "breathtaking" by BBC Radio 3. It featured prominently in The Daily Telegraph [CD of the Week], German MDR Figaro [Top 5 CD], and Czech Radio [5 stars]. The album was broadcast widely across 6 continents. Videos of Ivan Ilić performing Godowsky on YouTube attracted over 500,000 views. Shortly afterwards, he made his acting début in two French short films: Luc Plissonneau's Les Mains and Benoît Maire's Le Berger. 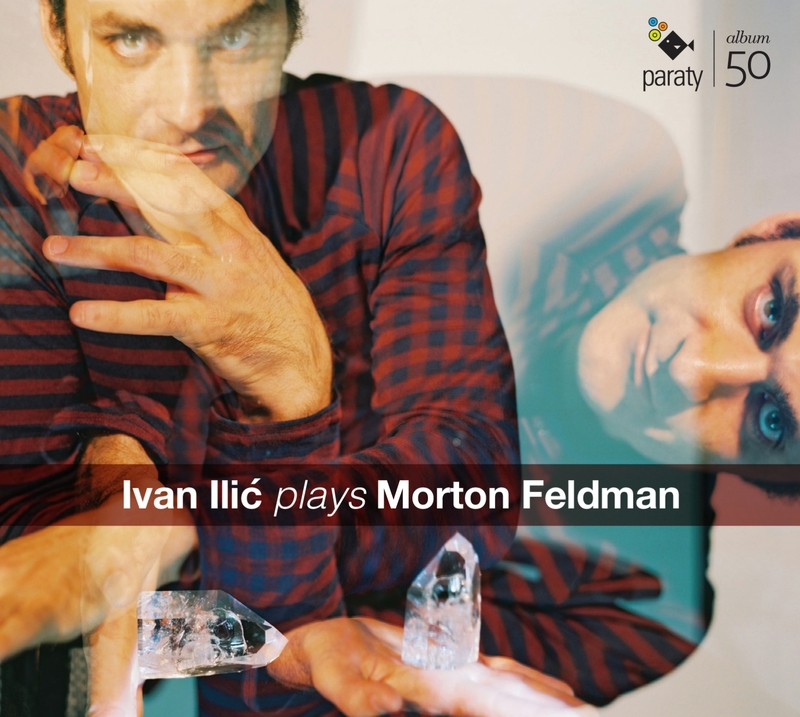 From left hand repertoire, Ilić shifted his focus to US composer Morton Feldman, which led to a trilogy of publications. The first was a CD, The Transcendentalist . The programme suggested a connection between Scriabin miniatures and late Feldman, with detours in early John Cage and a Feldmanesque new work by Scott Wollschleger. 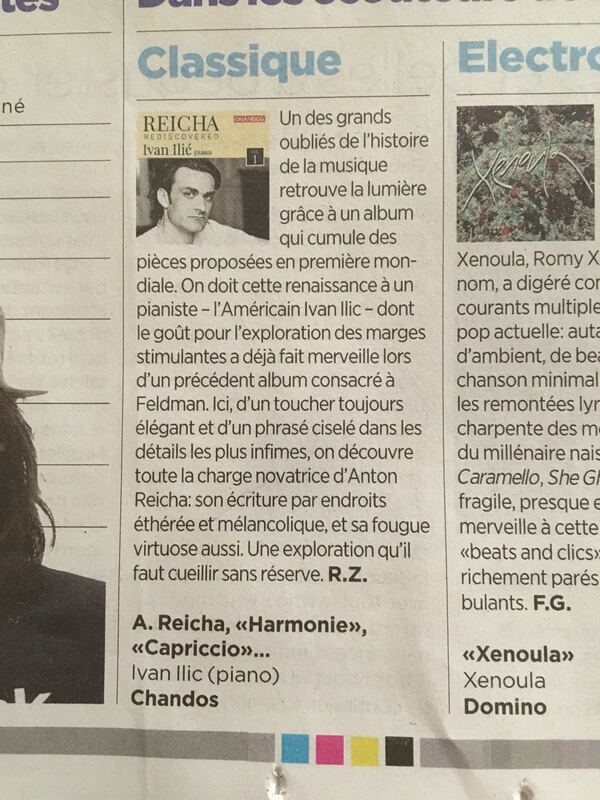 It was the Critic's Choice of BR Klassik [DE], Swiss Radio Espace 2 [CH], Listen Magazine [US], and Classique News [FR]. 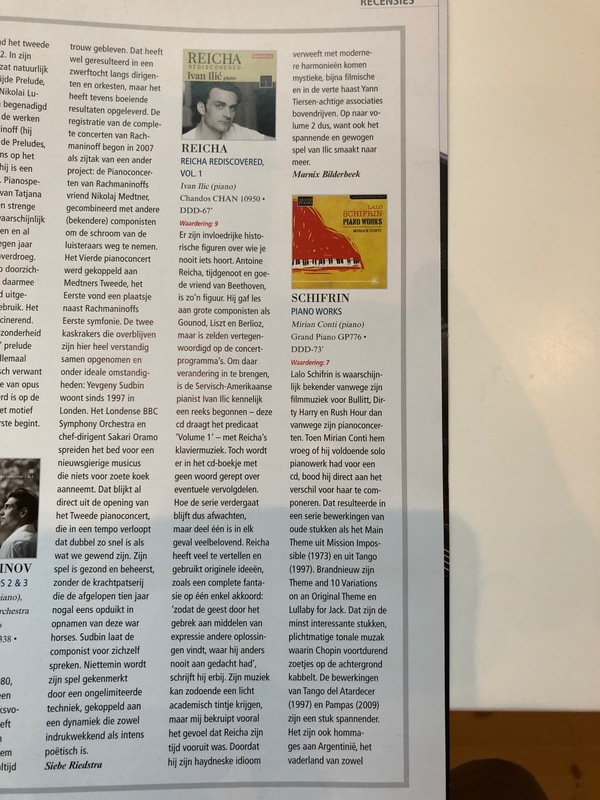 It was also a CD of the month of Sinfini Music [UK] and TGV Magazine [FR], won a Supersonic Award from Pizzicato Magazine [LU], and garnered 5-star reviews from Harmonie Magazine [CZ] and Aachener Zeitung [DE]. In November 2014 the album was nominated by the International Classical Music Awards for "Album of the Year". Forbes mentioned it in its 2014 list of Top 10 New Classical Releases. Part 2 of the Feldman Trilogy was an unconventional art book/CD/DVD, published by the Geneva University of Art & Design . 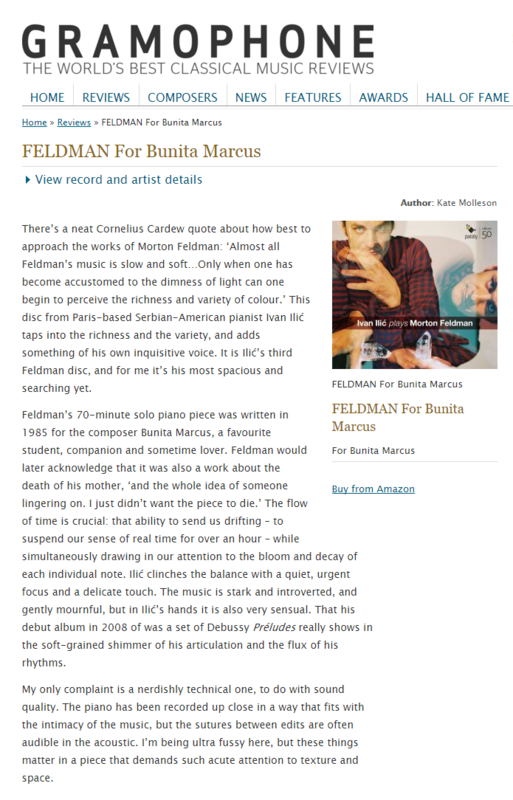 Part 3 – Ilić's recording of "For Bunita Marcus"  – was universally celebrated, with glowing reviews in The Independent [UK], The Washington Post [US], Diapason [FR], Fono Forum [DE], Gramophone [UK], BBC Music Magazine [UK], Classica [FR], BBC Radio 3 Record Review [UK], Piano News [DE], The Sunday Times [UK] and other publications. 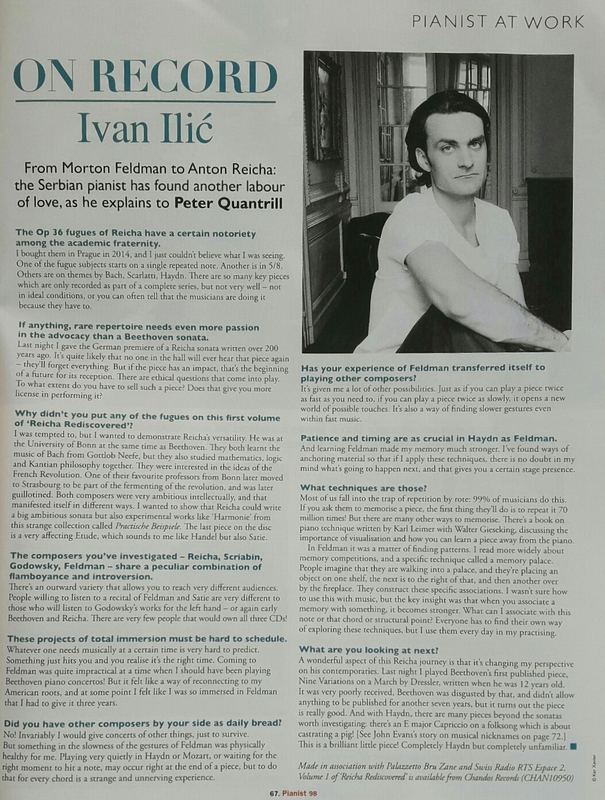 Ivan Ilić has written about music for the websites of Gramophone, BBC Music Magazine, Music & Literature and Limelight. He has also co-produced several 5-hour radio series for Swiss Radio RTS Espace 2. For 2019-2021 he was appointed Ulster University’s International Musician in Residence. In 2019 he will present a 9-part series about piano repertoire for Swiss Radio. 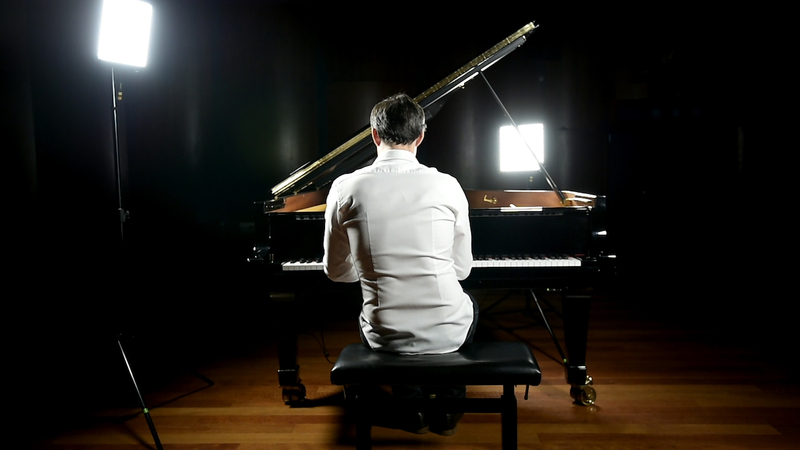 ###Watch Ivan perform Grieg on a Shigeru Kawai concert grand piano here. ###Ivan has been appointed International Musician in Residence at Ulster University (UK) for 2018-2021. ###Read the New York Times article about Ivan's Reicha project here. 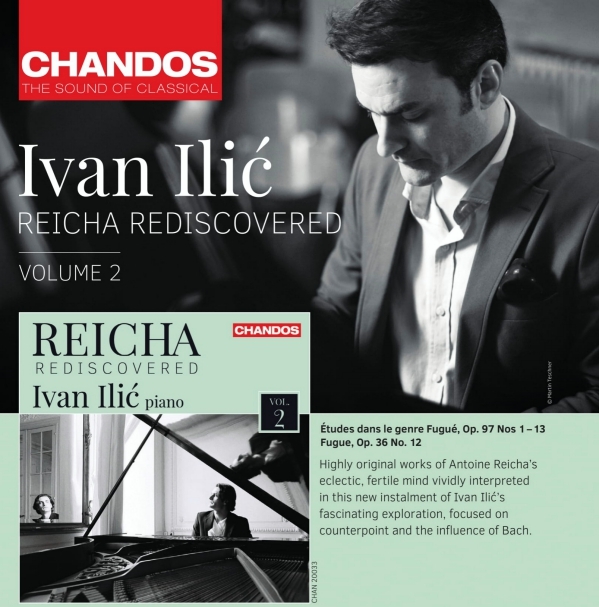 ###Out now: Volume 2 of Ivan's Reicha Rediscovered series for Chandos Records. Order here. ###To complement his Reicha Rediscovered CD series for Chandos Ivan recently filmed a 4-part documentary series about Antoine Reicha which he wrote and presented. Episode 1 (Berlin) is below. Episode 2 (Bonn) is here. Episode 3 (Hamburg) is here. Episode 4 (Vienna) is here. ###After his Morton Feldman Trilogy, Ivan is now focusing on solo works by Joseph Haydn, Ludwig van Beethoven, and Antoine Reicha. 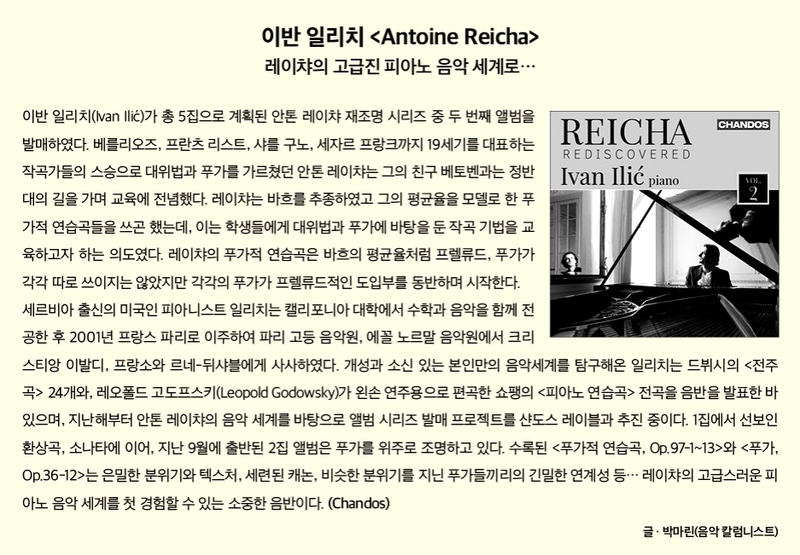 ###Ivan's next CD  will be dedicated to Czech composer Antoine Reicha. ###Read an article in the June 2016 issue of German Fono Forum about Ivan's involvement in the rediscovery of Haydn Symphony transcriptions by Karl David Stegmann [Deutsch] - [English]. Christoph Vratz's photo from the interview is here. Also: listen to an interview with German radio WDR 3 recorded in Cologne about the Hadyn/Stegmann transcriptions [link]. Listen to Ivan perform the slow movement of Haydn Symphony no 44 live on BBC Radio 3 [link]. 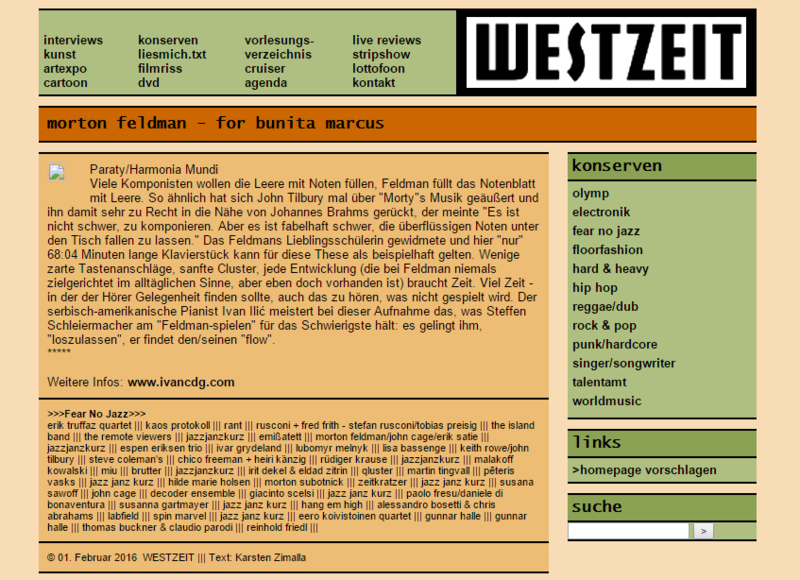 Read a review of the sold-out premiere in Berlin, published by Klassik Heute [link] and Pizzicato [link]. ###Ivan's recording of For Bunita Marcus  was released on 16 October 2015. 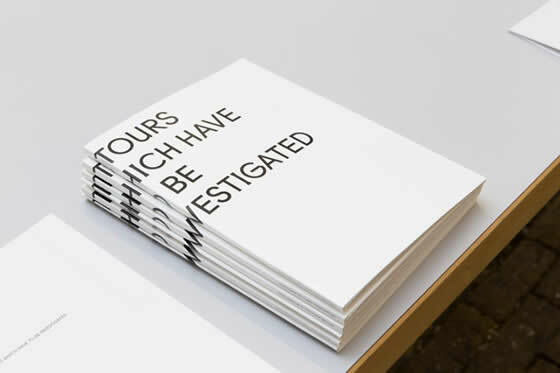 ###Part two of Ivan's Morton Feldman Trilogy - the art book Detours Which Have To Be Investigated - was published in November 2014. 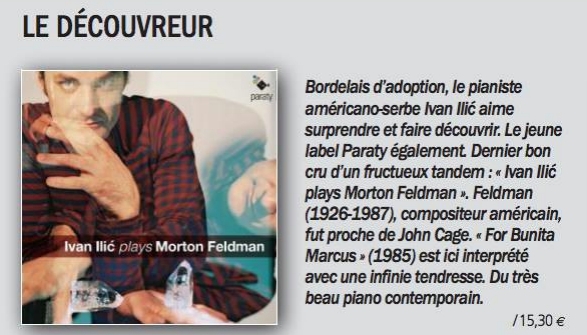 Detours Which Have To Be Investigated is an art book/CD/DVD, an homage to composer Morton Feldman. It is the result of a collaboration between Ivan Ilić, visual artist Benoît Maire, AMI graphic design, and the HEAD - Geneva University of Art & Design. The book includes texts and photos, including a never-before published photo of John Cage. The DVD comprises three videos which aim to make Feldman's music accessible to a wider audience. The CD is Ivan Ilić's recording of Feldman's final solo piano work, "Palais de Mari" (1986). Ivan Ilić gave the launch concert at MAMCO, Geneva's Museum of Modern and Contemporary Art, on 12 November 2014. ###Order the art book/CD/DVD at Mollat.com [link]. Alternatively, you can order it via this website. For more information click here. ###Recent broadcasts across 5 continents include German Westdeutscher Rundfunk WDR, Australian ABC Classic FM, Estonian Klassikaraadio, Irish RTÉ Lyric FM, American WFMT Chicago, American Minnesota Public Radio MPR, British BBC Radio 3, South African Classic FM, Swiss Espace 2, Italian Rete Toscana Classica, and Radio 4 Hong Kong. ###Ivan recorded five one-hour episodes of Musique en mémoire for Swiss Radio RTS - Espace 2 about the New York School of Music, originally broadcast in October 2014. ###Ivan's CD - The Transcendentalist - was released in 2014. The Transcendentalist is an exploration of meditative music. It traces a mood from miniatures of Alexander Scriabin to John Cage and Morton Feldman, to a new work by a young American composer: Scott Wollschleger. Ivan Ilić, we have access to a contemplative world of inner calm. Click here to learn more about The Transcendentalist, and to peruse CD-related press. For a selection of CD reviews please click here. ###The Godowsky CD was released in 2012. For order information click here. 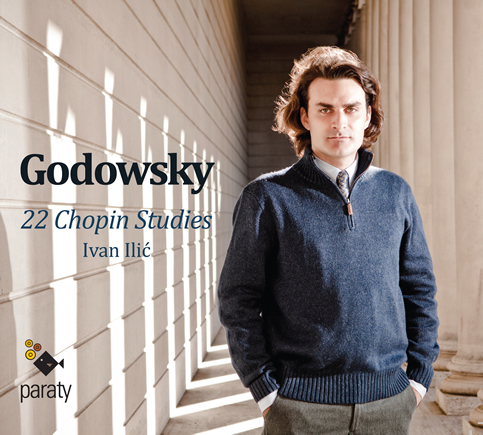 Click here to learn more about the Godowsky CD, and to peruse Godowsky-related press. For a selection of Godowsky CD reviews please click here. ###The short film Les Mains by Luc Plissonneau is now available below. Ivan plays the lead role of Izak in a love story about an introverted pianist and Lucie, his student muse. Liszt Variations on a theme by Bach, "Weinen, Klagen"
Visit the audio archive here. "The warm tone, velvety touch and the intimate, dreamlike atmosphere he creates are admirable." "Ivan Ilić succeeds in transforming the acrobatics to open jubilation and aesthetic ecstasy." "Ivan Ilić deserves a medal for his purposeful, intelligent grasp of this taxing music." 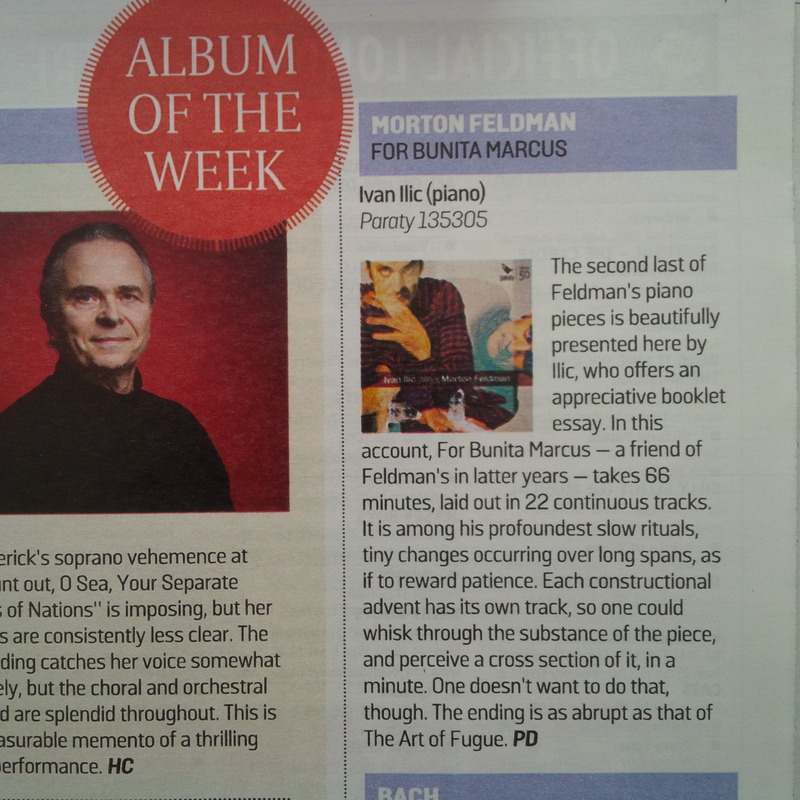 "Ivan Ilić achieves a very musical performance, and technically impressive, especially articulation-wise. If his goal was to generate the radiant chopinite spectre of voices and colours with five fingers according to Godowsky's arrangement, he succeeds utterly." "His playing is brilliant and luminous. A fine, impressive recording by an outstanding pianist." "The legato and polish of his playing are exemplary." "Looking at the score will make you dizzy. But Ilić's interpretation is pure poetry." "Ivan Ilić masters these touchstones seemingly effortlessly!" "A virile touch and well-controlled passion." "His musical intelligence runs deep...this was virtuosity of the mind as much as of digital dexterity." "He is a magisterial technician, with a formidable brain and a far-reaching sensibility that reaches far further than the immediacy of his sleeve or his heartbeat." "The program was an adventure in learning as well as a brilliant display of technical prowess, all free of clichés." 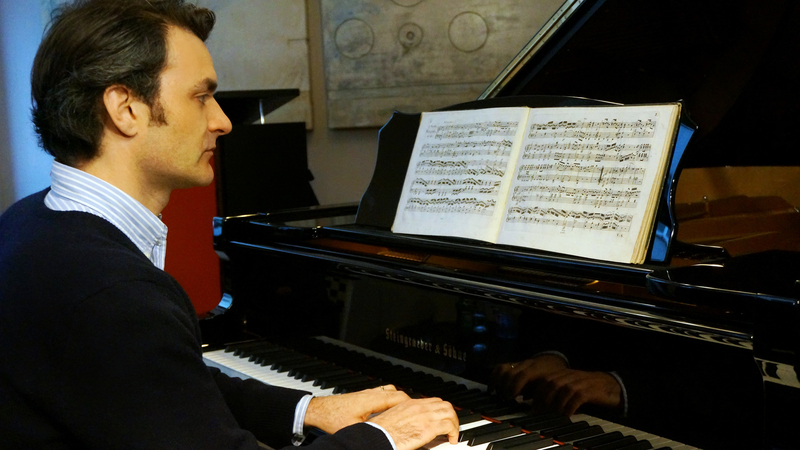 "Ivan Ilić takes on Claude Debussy’s Préludes in an entirely original and fascinating way." "Ivan Ilić, an American based in Paris, has a deftness of touch that allows him control over both Debussy’s exuberant climaxes and his quiet, subtle moments." 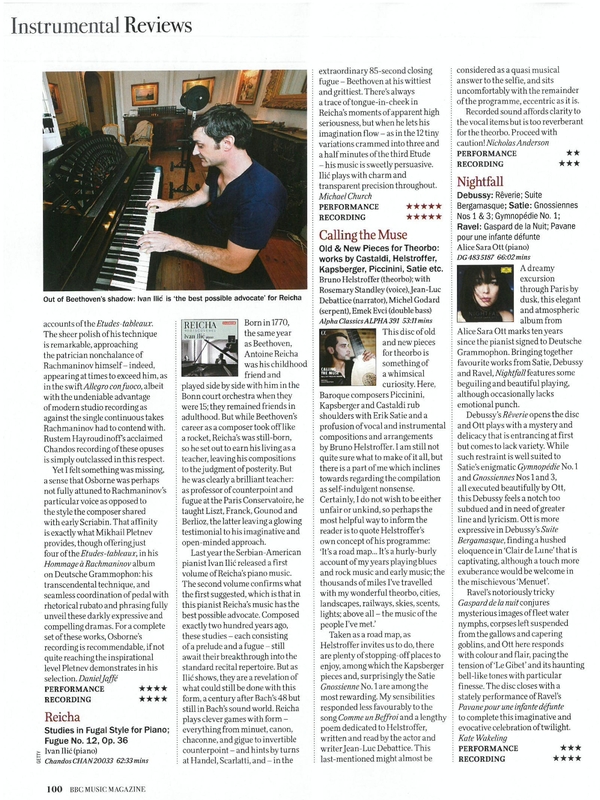 "His playing is characterised by clarity, vivacity and his intuitive feel for systems in the music...one to watch." 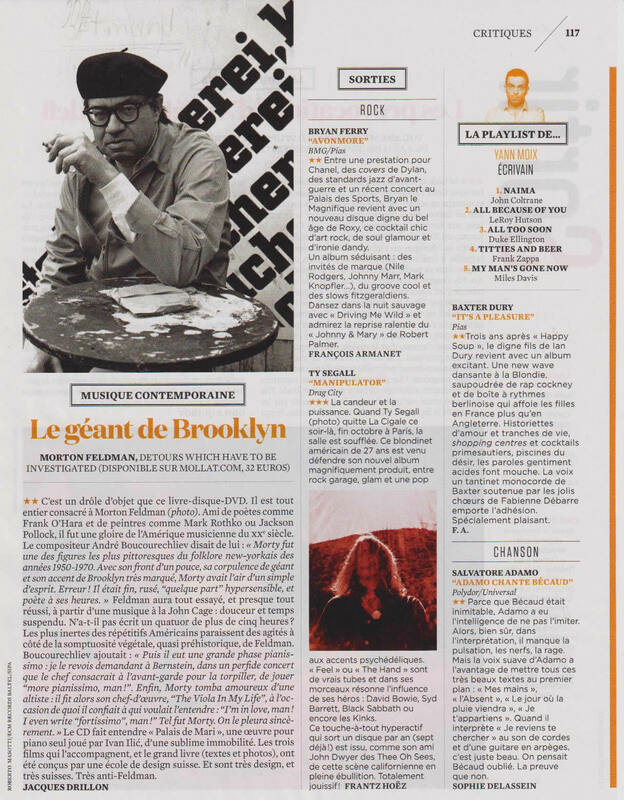 Le Monde de la Musique, France. "Ivan Ilić’s approach is intimate and poetic without being over-indulgent; this is spirited and carefully distilled playing." For a selection of CD reviews from 2012 please click here. For a substantial selection of reviews from 2006-2009 please click here.